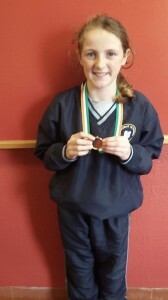 Laura Purcell in Fourth Class crossed the line in first place on Wednesday October 1st. She led from very early on and crossed the line with ease. She was also part of the Third / Fourth Class team who collectively achieved the silver medal position. All those who attended put in great effort into their training and Gortnahoe N.S. is very proud of all who participated.